Aung San Suu Kyi: Burma's fading light? For many Aung San Suu Kyi has come to embody the struggle for democracy in Burma. Poised and dignified, her moral authority has ensured the silent but unwavering support of her people, for whom she remains a symbol of hope. Detained by the junta for much of the past two decades, her refusal to leave Burma has kept the plight of its people on the international agenda. A Nobel peace laureate, she has been lauded by presidents and religious leaders for her enduring commitment to a democratic Burma. But on the eve of the country's first elections in 20 years, she remained a political phantom of sorts. Her National League for Democracy (NLD), which was cheated of its victory at the polls in 1990, is now defunct, its members divided. The 65-year-old remained cloistered in her crumbling lakeside home in Rangoon during the election so could play no part. It is clear that the junta's election laws have left Ms Suu Kyi on the political sidelines, but has her idealism contributed to this isolation? The NLD was given the choice of expelling Ms Suu Kyi (and accepting the annulment of the 1990 poll victory) or not contesting the election. It took the painful decision to disband - and called for a boycott. But the party split internally, with some members deciding to compete as the National Democratic Force (NDF), arguing it made more sense to be involved in the process, however flawed. The division has become acrimonious, with some activists accusing the NDF of betraying the long struggle for a true democracy. This has left Aung San Sui Kyi open to criticism that she has weakened the opposition at a time when unity would have served it better. Win Tin co-founded the NLD with Ms Suu Kyi and spent 19 years as a political prisoner in the country's notorious Insein jail. The 81-year-old says many Burmese people are confused and despondent that the NLD has been dissolved. "But they know in their hearts that the alternative opposition parties cannot win in the way that Aung San Suu Kyi did in 1990," he said. "We don't believe it's a real political solution." Speaking before the polls were held, the British Ambassador to Burma, Andrew Heyn, described them as a "complete failure". He said the junta had failed to meet any of the prerequisites for a legitimate vote. He cites a constitution that guarantees a dominant role for the military, and more than 2,000 political prisoners still in jail among the reasons why these elections cannot be free, fair or inclusive. "This is a huge missed opportunity," he said. 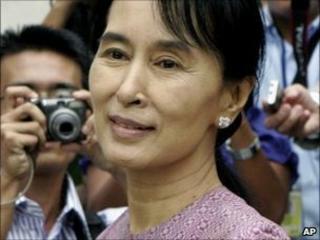 Ms Suu Kyi said her party should "not even think" of running because of the nature of the election laws. And although on the voters' list, she has refused to take part. But without the participation of Ms Suu Kyi and the NLD, many voters were left without a choice. NDF chairman Than Nyein said his new party was determined to offer those supporters a voice. "We take this coming election as a first step in a long journey." Ms Suu Kyi's perseverance has been seen by many as a positive force for Burma, but some say her rigidity has held the pro-democracy movement back. "Far more an idealist than an astute political operator, in hindsight she can be criticised for not bringing on a younger leadership within her now disbanded party," says Justin Wintle, author of the biography Perfect Hostage. "Back in the late 1990s she perhaps missed a trick by not leaving her country when she was free to do so - she could then have addressed the UN General Assembly and other international bodies." Mr Wintle and others suggest that her support for sanctions has been counter-productive, serving mainly to deprive the majority of the population, and that now is the time for a new approach. Burma is part of an Asian economy that is changing at great pace. Its own market is freer - although still very corrupt - compared with the socialist state-controlled economy of 20 years ago. The generals have recently started "privatising" state assets - ports, airways, highways, mines. Oil and gas pipelines to China are under construction. Already, the sale of gas to Thailand has made some rich. Thant Myint-U, a Burma historian and a former UN official, says it might be easier for Ms Suu Kyi to push for economic change and development. It does not mean devaluing or giving up on ideals of democracy but the right kind of trade and business links with the outside world will be critical in expanding the middle class, making possible broader-based growth, and in the process create new political dynamics, he says. "Economics has a way of shaping politics, in Burma like everywhere else. "For the democratic opposition, including Aung San Suu Kyi, it's vital that they factor in the huge changes taking place in Burma's economic relations with the rest of Asia," he says. What happens next is impossible to predict, but it is clear Ms Suu Kyi must evolve with the political landscape if she is to remain relevant. Some analysts believed her release would only come on the presumption that the transition from military rule to "democracy" had been safely wrapped up in the junta's favour. Speaking before she was freed, Mr Heyn said the UK and EU were pressing hard for her unconditional release, and that her freedom would have a "significant impact". All tangible signs of her are banned in Burma. Millions there have never seen Ms Suu Kyi or heard her speak. But Win Tin says there are many who understand what she represents, and Burmese people would flock to hear her speak. It is unthinkable that she would leave Burma, instead "she will need to adapt to new realities with which she has had limited contact", Mr Heyn said. It is possible a number of opposition parties will now hold seats in the new parliament. Power may be slightly dispersed - and the hope remains that even a heavily repressed democracy could take on a life of its own. Some in Burma now want Ms Suu Kyi to take on the role of elder statesman and pursue change in general, instead of pushing for legitimate political office. Analysts say she must be willing to think about more than pure politics - but this will be personally and ethically difficult as long as dozens, possibly hundreds, of her supporters remain in prison.